Kotaku's Brian Ashcraft reports on the new all black burger at Burger King Japan, a sandwich with black buns, black sauce, and black cheese darker than a black hole (seriously, the cheese is extremely black.) It looks kind of gross—but I really want to try it. How is this black cheese so dark, you ask? It isn't plastic—although it looks like it. It's made smoking it using bamboo charcoal. It probably tastes delicious. The buns are also smoked with bamboo charcoal* and, according to Ashcraft, the sauce is made with onion, garlic, and squid ink (which sounds rather delicious.) The beef patties made also contain black pepper. 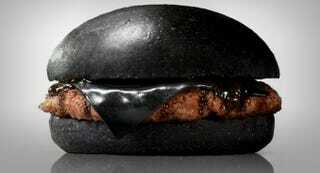 * Casey just reminded me of the Dark Vader burger, which also had black buns, but it wasn't as extreme as this one.